Recently Robert Rowley, chair of the Stonewall Democrats of Arizona received a letter from former Dem. Sen. Barney Frank in which he talks about the organization he started in 1998 and says he is "confident the people of Arizona will join those in many other states in recognizing that the past practices of discrimination have no legitimate basis." Observer Weekly: You and who else reignited the Stonewall Democrats of Arizona? Can you tell us how that came about? Rob Rowley: Here's the story behind Stonewall Democrats of Arizona. Several months ago my close friend Richard Adams, and I were approached by Don Jorgensen, chair of the Pima County Democratic Party, and Shasta McManus, executive director of the Pima County Democratic Party, about getting Stonewall going again. Southern Arizona Stonewall Democrats pretty much passed away at about the same time as its powerhouse leader, Maurice Grossman did several years ago. Rick and I accepted the idea and went to work on it. After a great deal of research we found that if we operated as a state political action committee we would be able to do far more than just operating as a club. About a month ago Rick and I filed our paperwork with the Arizona Secretary of State and Stonewall Democrats of Arizona was born. Rick and I had both been members of the board of directors of Tucson Pride for the past year and, due to a possible conflict of interest, both of us resigned from the board. Stonewall Democrats of Arizona is organized as a state-wide organization --a PAC and Democratic club combined. Our current leadership consists as me as chair and Richard Adams as secretary/treasurer. Special Advisers include Jo Hafford, field director at Maricopa County Democratic Party, Daniel Hernandez from Tucson's Sunnyside School Board, C.J. Carenza, co-founder and co-chair of the Arizona Democratic Party LGBT Caucus and Tucsonan Vince Rabago, PLC. Chair of the Pima County Democratic Latino Caucus. OW: How does it feel to have accomplished this? RR: How does it feel? The honest answer is scary. Arizona's elected Democratic officeholders and candidates are some of the nicest and hardest working people around but trying to remember the complete roster, who's in office and as what, who's moving or trying to move from what seat to what seat and who's new and trying for what seat is daunting. Learning the interactions, keeping or trying to keep up with Arizona's convoluted campaign finance laws keeps one not only busy but with a slight perpetual feeling of confusion. Throw in networking with politicos on the national stage and you can imagine how surreal it can get. OW: What is your next Big Fish? What's on the radar for you in the coming months? RR: Stonewall currently has its 2014 Equality Survey out to not only Democratic officeholders and candidates but Republican and Independent officeholders and candidates as well. The deadline for the return of the survey is early June. Getting these back from the busy candidates, reading and evaluating them will keep us busy for a while. Next up is the Primary Election in August followed by the General Election in November. Through all of this Stonewall will continue in its attempt to get people registered to vote, educating voters and trying to energize people -- especially the LGBT community -- to vote. Further, Stonewall will be hosting fundraisers for not only itself but for various candidates as well. 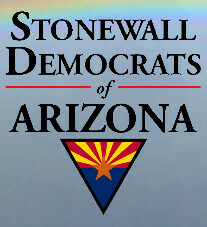 OW: How can folks contact you to become members of the Stonewall Democrats of Arizona? RR: Stonewall tries to keep its website updated with current happenings and information. For those wishing to get involved with the Stonewall Democrats of Arizona, membership forms and information can also be found on our page at http://stonewalldemsaz.org. We can also be found on FaceBook at https://www.facebook.com/Stonewall.Democrats.Arizona or on Twitter at @StonewallDemsAz. OW: Can we reprint Frank's letter? process-and Arizona is as we discussed, a prime example of that. Democratic organization is one very good way to accomplish this.